Since 2012, District 9800 – through Women in Rotary – has held five annual International Women’s Day Breakfasts, drawing an average audience of over 1200 (of which 80 per cent are non-Rotarians!) and reaching more than 5000 men and women in total. At these events, Women in Rotary has showcased the work of Rotary, generated an awareness and understanding about the organisation, spread the word that Rotary welcomes women, and invited attendees to visit a Rotary meeting with the “Rotary is not just for blokes” invitation (pictured right). In the weeks before and after International Women’s Day, the media is full of coverage discussing gender and diversity issues. Celebrating International Women’s Day through the International Women’s Day Breakfast provides Rotary with an opportunity to help us be seen by the public as a progressive, contemporary organisation that encourages diversity. International Women’s Day is also an opportunity for us to reflect on how diversity can help our membership numbers increase. At the moment, only 24.9 per cent of our members are women – a long way from a 50/50 gender balance that reflects the communities in which our clubs work. A fabulous panel, including Tom Gleisner (MC), Maxine McKew (moderator), Ahmed Fahour (Aust ralia Post), Marie Turner (Mitsubishi Australia), Mark Woods (past president of the Law Institute of Victoria) and Sally Warhaft (ABC presenter). With over 1200 men and women in attendance, including 100 Victorian Certificate of Education (VC E) students, the room was abuzz, with a fiery discussion and lots of messages to take back to the office. The event also raised over $50,000 for various charities, including Violence Free Families, lnterplast, The Butterfly Foundation and Early Learning Autism. If you are considering doing something within your district or club in the coming year to promote gender diversity, contact Kerry Kornhauser from Women in Rotary in District 9800 on 0411 597 690. 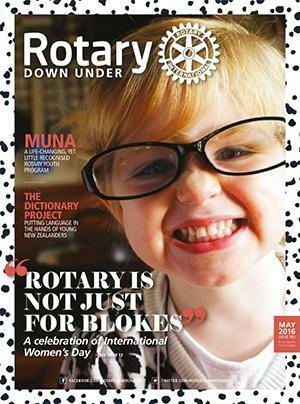 The ‘”Rotary is not just for blokes” invitation was designed and created by David Baker, of the Rotary Club of Camberwell, Vic, and features his granddaughter Zoe.